“A global crisis is unfolding. The rapid expansion of development projects on indigenous lands without their consent is driving a drastic increase in violence and legal harassment against Indigenous Peoples. I’ve been alerted to hundreds of cases of “criminalization” from nearly every corner of the world. These attacks—whether physical or legal—are an attempt to silence Indigenous Peoples voicing their opposition to projects that threaten their livelihoods and cultures. 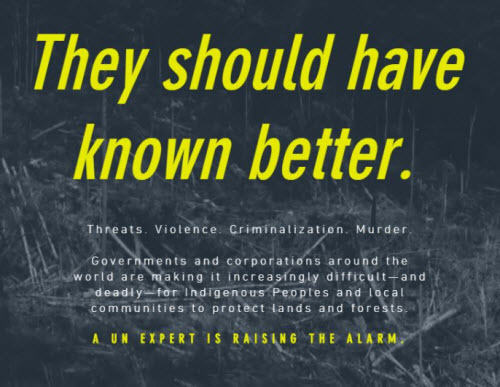 My new report finds a pattern of abuse, with the private sector often colluding with governments to force Indigenous Peoples from their lands by whatever means necessary to make way for infrastructure, agriculture, mining, and extractive projects. According to Front Line Defenders, 67 percent of the 312 human rights defenders murdered in 2017 were defending their lands, the environment, or indigenous rights, nearly always in the context of private sector projects. Around 80 percent of killings took place in just four countries: Brazil, Colombia, Mexico, and the Philippines. These murders nearly always occur in the context of ongoing threats against entire communities. The first step is typically smear campaigns and hate speech that paint Indigenous Peoples as “obstacles to development”—or in the worst cases, terrorists or thugs. Then come arrest warrants on trumped-up charges, which are sometimes deliberately left hanging so that communities live under perpetual threat. When indigenous leaders are arrested, they often sit in jail for years awaiting trial. In many of the worst cases, militarism, anti-terrorist legislation, and “states of emergency” are used to justify escalating physical violence. I myself was put on a list of terrorists by the Philippines government in retaliation for advocating for the Indigenous Peoples in Mindanao, many of whom have been displaced by growing militarization. Although the case against me has been dismissed, there are still many others on the list who have been falsely accused and whose safety and security are under threat, including long-time indigenous advocate Joan Carling. At the same time that justice systems are wielded as weapons against Indigenous Peoples defending their rights, there is widespread impunity for those who commit violence against Indigenous Peoples. At the root of this global crisis is systematic racism and the failure of governments to recognize and respect indigenous land rights. Indigenous Peoples and local communities customarily own more than 50 percent of the world’s land but only have legally recognized rights to 10 percent. This enables governments to declare them “illegal” on the lands they have lived on and protected for generations. In spite of incredible risks, Indigenous Peoples continue to speak out. They continue to defend their ways of life, their communities, and the lands and forests all humanity depends on. Testimonies of indigenous leaders and more information about the ways to take action are available at the link below.